It’s Saturday and that of course means Snapshot Saturday sponsored by Melinda at West Metro Mommy. When you’re finished here, be sure to visit the rest of the Saturday Snappers over there! I haven’t been taking a lot of photos lately, no particular reason why, I just haven’t. Luckily for me I have plenty left from the day I went to the local nursery to pick out flowers with my friends. I’m not sure, but I think these are petunias…I don’t have much of a green thumb, I rely on my sister, Ele for that!! I love the intense color of these and since I was in a greenhouse, the sun was very bright, but the color held its vibrance. I had almost forgotten I had these photos. Glad dug around on my memory card to find them. you are correct, they are petunias, and beautiful ones at that! Very nice photo, looks professional! Thank you, Ms. Ele! I knew you would know!! Glad you like my photo!! 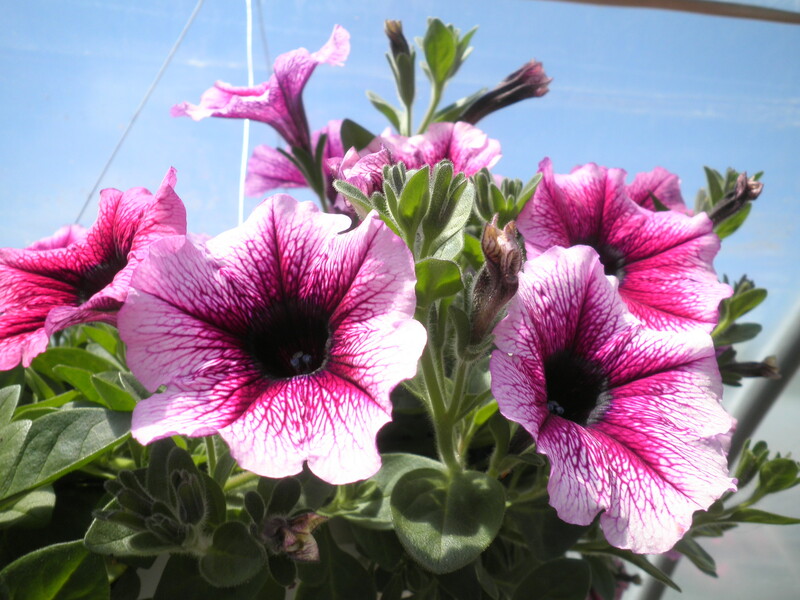 I adore petunias….and that’s one of the flowers I do recognize…lol; my mother grew them in our garden when I was a kid. Thanks for sharing, and for visiting my blog. Thanks, Laurel! Thanks for visiting back! I thought they were so pretty! Fran, the colors in these are just gorgeous! great shot. Thanks, Diane, I loved the color too! Beautiful! Now that it is actually sunny out here I am in the mood for flowers! Thanks, Sheila! Flowers are going crazy here in NJ. Have a great weekend! Thanks, Jackie, I was pretty happy with them! Thanks, Diana! I don’t have much of a green thumb either. Thanks for visiting! Beautiful! I love the intense color and the contrasting veining. Great pictures! I can almost smell their light fragrance! Thanks, Kim! Glad you like them. I thought they were awfully pretty. Hugs, Sweetie! 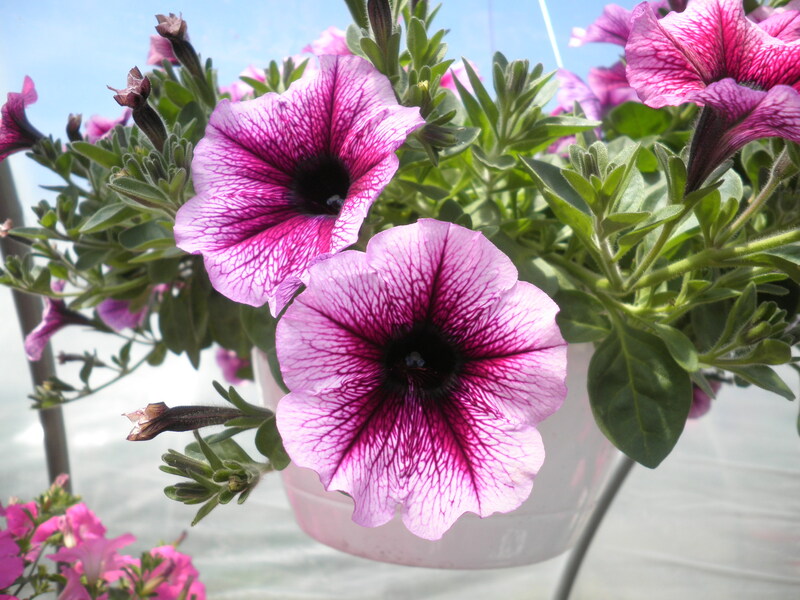 I love the colors of petunias — such pretty photos you made of them! Thanks, Joy! Great to hear from you! I don’t have much of a green thumb either but I do love flowers like those. I love them too, that’s why I went crazy with photos at the nursery! Have a great day! Simply gorgeous! I love going to all the nurseries to see all the colorful blooms! Thanks, Katy…I Love to do that! I love the colors of those flowers! Thanks, Melinda, I love purple so these were the flowers for me! Have a great day! Beautiful petunias! I’m glad you shared those. Thanks, Stacie…glad you liked them! Have a great day! That’s a lovely variety of Petuna. I thought so too, Leslie, that’s why I couldn’t resist the photo. Have a great day! Ameena, she actually can do that. I gave her two plants to care for when we went on our month long trip last summer. One was beyond her help…I sort of knew that…but she saved the other one. I’ve been afraid to take it back for fear it will go to the great garden in the sky if I do. She’s very good at plants! Have a great day! Petunias just grow themselves, and reward you with such pretty colours. I’ve heard that, Louise. That’s the kind of plant I do the best with! Have a great day! Pretty! The color is really beautiful! Thanks, Vicki! I was really happy with these!